Thanks to Paul Tappenden for this great article! This ubiquitous wayside weed is both nutritious and medicinal. It is abundant in Vitamin C and other essential vitamins and minerals (particularly iron), and, although it has a strong, earthy flavor, it makes a great addition to a spring salad. By mid-summer it gets leggy, burnt out and looses all its color, however, as soon as it cools off in the fall, it is back with a vengeance. For use as a medicine, the plant can be made into a tincture, an oil or a tea (with fresh or dried leaves and flowers). The oil in the seeds is high in antioxidants. The entire plant is used as an anti-inflammatory, antibacterial and anti-fungal, and has been successfully tested in the treatment of E. coli (Hacepttepe University Journal of the Faculty of Pharmacy in Turkey). 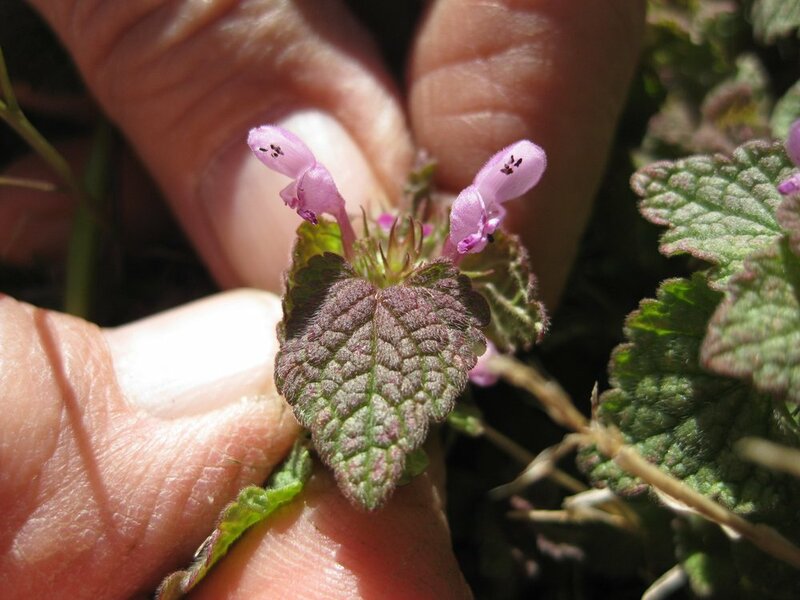 Dead Nettle will not sting. Unlike with true nettles, these fuzzy leaves don’t sting, yet, like their cousin, the Stinging nettle, they are excellent for treating allergies. If you suffer seasonal allergies and you don’t drink nettle tea, you are doing yourself a disservice. You may never need to take an antihistamine again. 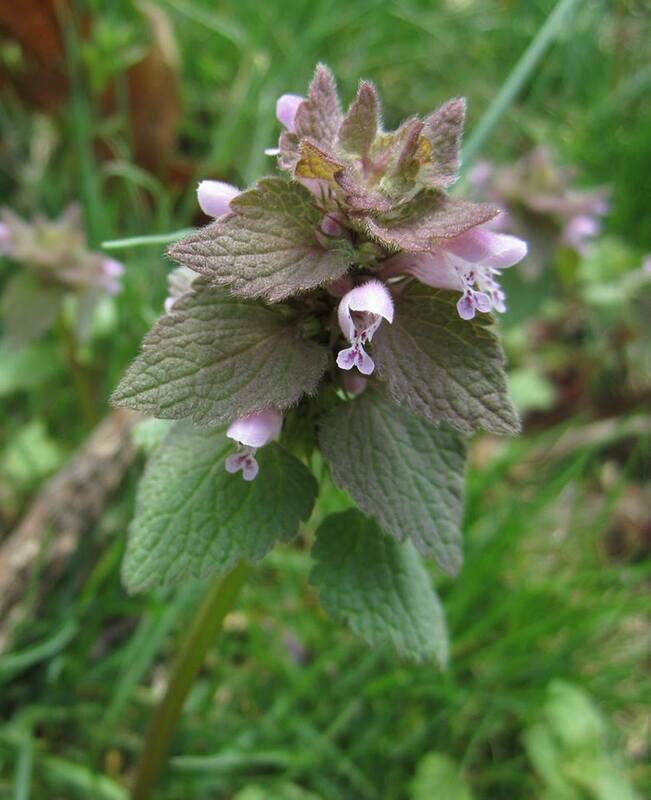 Dead Nettle is a natural source of flavonoids, like quercetin, which can improve the immune system and lessen inflammation. On top of all this, the bruised leaf or the tea are effective in stopping bleeding (try it - it really works!). If you cannot find Plantain or Yarrow growing (especially at this time of year), this is the go-to plant for treating wounds. What is particularly interesting about this self-seeding annual, is that it spreads its seeds with the help of an army of little volunteers - ants. They carry the seeds back to their colonies feed to their larvae. The larvae can’t actually eat the tough seeds, however at the end of each one is a tasty morsel called an elaiosome which they gobble with relish, leaving the seeds unscathed and conveniently planted underground (what a great system). When you look at the way that we “intelligent” beings run he world, you might wonder why we haven’t learned more from nature. It seems that several ephemeral species use this method of seed dispersal, including Trout Lily and Dutchman’s breeches. I’ll tell you all about them in April.